Let’s set the stage for discussing the scandal at the Department of Veterans Affairs: A new president, promising hope and change, campaigns to help veterans and improve their medical care. He appoints a decorated war hero to head the Veterans Bureau. But soon thousands of veterans complain about wait times and lack of treatment. On the financial side, leaders at the Veterans Bureau cook the books, and make fortunes buying and selling land to build new VA hospitals. Taxpayers lose millions of dollars in fraud and the medical needs of veterans are often ignored. Sound familiar? It should. That’s the story of President Warren Harding and Charles Forbes, the man Harding chose as the first head of the Veterans Bureau. From the start, the Veterans Bureau was corrupt and mismanaged. Government was not capable of sound administration in the 1920s, under President Harding, and not much has improved ninety years later under President Obama. 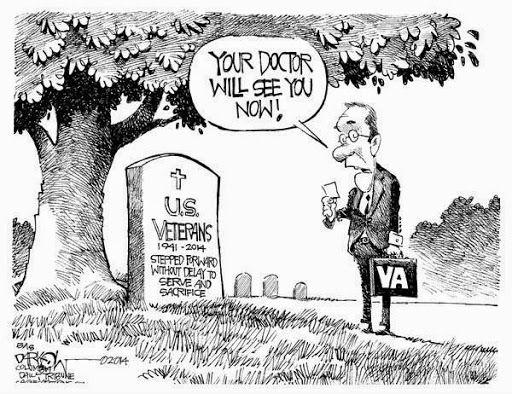 The fraud at Veterans Affairs then and now may be a foreshadowing of government-run health care for the nation. The idea of hospital care for veterans began after World War I. Before that, war veterans received small pensions if they could show they were injured in military service to the point they could not do their civilian jobs. The American Legion became a powerful lobby after WWI, and free health care for vets became a reality in the 1920s. A more financially sound idea for providing medical care would have been to give vouchers to veterans for medical services at existing hospitals. But politicians saw advantages to setting up special veterans’ hospitals in their political districts–Congressmen, under a system of government-run hospitals, could take credit with voters for building new hospitals locally for veterans. The good intentions of medical help for veterans turned into scandal and fraud right from the start. President Harding and the many supporters of the new veterans’ hospitals did not understand that new incentives were in place for corruption, not health care. Lt. Col. Charles Forbes, the new head of the Veterans Bureau, won the Distinguished Service Medal in WWI. But once in power in government, he and his friends made millions of dollars from selling high priced land for the new hospitals, and then overcharging to build them. Forbes also made money marking up the costs of medical supplies–all of which took up so much of his time that he never answered 200,000 letters from veterans asking about available medical care. Many veterans suffered from lack of treatment. Harding was furious when he discovered Forbes’s shenanigans; Forbes was eventually fined and went to federal prison for over a year. Privately run hospitals would go bankrupt if they were so corrupt and inefficient. But government-run hospitals can simply fire the culprit, if he is caught, and ask Congress for new funding. Then the cycle of fraud is potentially set to repeat itself. Some of the current VA administrators, for example, even received bonuses after deaths of veterans occurred on their watch from lack of treatment. “We lack funds,” is the battle cry of the Department of Veterans Affairs (and most other government agencies). The VA budget, however, has tripled in the last fourteen years–faster growth than for any government agency, according to Damian Paletta of the Wall Street Journal. True, the number of veterans has increased during these years, but so has the VA staff, which now numbers almost 300,000. The nature of government agencies is to be attuned to political shifts (to keep the funding coming), to fire almost nobody, and to give raises whether earned or not. The Department of Veterans Affairs is not subject to competition, the way private business are, and the bigger the agency the more unwieldy it becomes. Multiply the problems at The VA by about fifty and you may have the U.S. in 2020 with Obamacare. One final question: Harding is rated as one of our worst presidents, primarily because of scandals–led by the disaster at the Veterans Bureau. Will President Obama suffer a similar fate in his evaluations by historians? Previous post: Individual Rights or Community Rights? Next post: Do Crony Handouts Have a Stranglehold on the GOP?